Combine the water, vegetable oil, butter, milk and salt in a medium saucepan over medium heat and bring to a boil, stirring occasionally. Add the flour all at once and stir with a wooden spoon until smooth. Cook the mixture over low heat until it dries slightly and leaves the sides of the pan, about 1 to 2 minutes. Remove the pan from the heat and add the eggs, one at a time, beating until each one is fully absorbed before adding the next one. Cover a baking sheet, preferably one without sides, with parchment paper. Place the paste in a pastry bag with a round tip with a 1/2 inch opening. To make cream puffs, hold the pastry bag at a 45 degree angle touching a paper lined pan. Squeeze the bag. Continue forming the puffs 1 to 2 inches apart. To make eclairs, squeeze the bag as you pull it toward you, making 3 inch long fingers. Place the choux in the oven, and after 5 minutes, lower the temperature to 375 degrees F. Depending on size, they will require 10 to 15 minutes total cooking time. NOTE: If the oven door is opened before they’re almost finished baking, they will collapse, so don;t peek until 10 minutes have passed. To test for doneness, tap one on the bottom. It should sound hollow. Remove and cool on a rack. Pastry cream or crême patisserie is all flour-based custard used as a filling for cream puffs and eclairs. After it’s cooked, place a sheet of plastic wrap on the surface or sprinkle with granulated sugar to prevent a “skin” from forming and refrigerate immediately. Combine milk, butter and vanilla in a saucepan and bring to a boil over medium heat, stirring occasionally. In a separate bowl combine the eggs, egg yolks, sugar, flour and orange zest and whisk until smooth. Pour the cream into a bowl and place it in a larger bowl of ice water to cool it as quickly as possible. Pastry cream can be refrigerated for 2 days. Wait until the puffs are cool and cut off the top third with a sharp knife. Fill the hollow bottom with a savory such as chicken or crab meat salad or sweet such as pastry cream or ice cream Replace the top and serve. 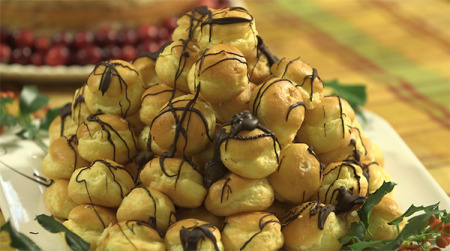 If the filling is a sweet one, dust the cream puffs with confectioners’ sugar or pour chocolate sauce over the top. When choosing chocolate, look for a shiny finish, which is a sign that the chocolate was heated at the right temperature for the right amount of time. Also, look for a crispy snap when chocolate is broken into pieces. Choose a good chocolate source for sauce like Lindt, Callebaut, or Scharffen Berger. In a pinch, chocolate chips will do. This very decadent sauce is ideal served with fresh strawberries. Note: this chocolate sauce recipe is not ideal for coating dipped strawberries. That’s another post. Optional: 1 Tablespoon Brandy or Grand Marnier Place chopped chocolate in a bowl and set aside. Place cream, sugar, and corn syrup in a small pot. Heat to a boil stirring constantly. As soon as it reaches a boil pour directly over chocolate and stir until all chocolate has melted. Add vanilla and brandy. Use immediately or cool, cover and refrigerate for up to two weeks. To reheat, heat the amount you need over a double boiler and stir until just melted.